Take this with a grain of salt, but a recent study has found that your phone might not be the best influence on you. At least, when you need to focus or remember things. In a paper published in the Journal of the Association for Consumer Research, authors Adrian F. Ward, Kristen Duke, Ayelet Gneezy, and Maarten W. Bos disclosed the results of a study they performed. 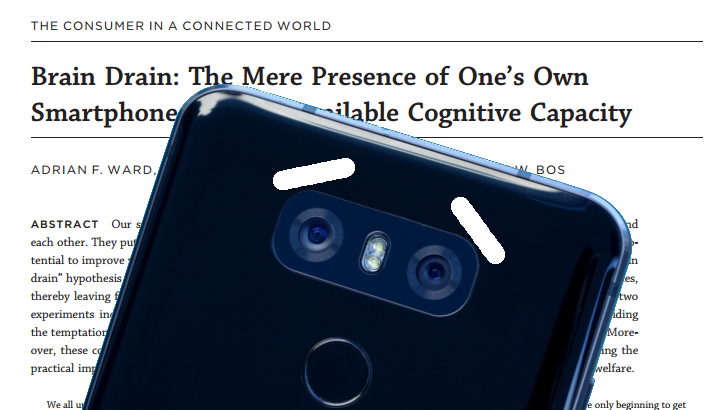 They posit that their results demonstrate a reduction in available cognitive capacity of individuals when a phone is present and that this effect increases the more dependent one is on their phone. The full details of the study can be seen here if you'd like to view their experimental procedure yourself. The (literal) TL;DR version is that they did two separate experiments. The first got together a bit over 500 undergraduate students, had them put their phone in one of three locations, and tested them with two tasks meant to measure their "available cognitive capacity." They found that the students who left their phones visible on the desk performed more poorly on the tasks than those which left their phones outside. The second experiment was constructed to better determine if the phones were the cause of the performance. 275 undergraduate students were again assembled, and they were again asked to perform tasks after placing their phone in a specific location, and they also included a questionnaire for self-reporting an individual's reliance on a phone. Again they found that those who were asked to leave their phone in another room performed better, and the other two sets (pocket/bag, desk) had no significant difference. Those who self-reported increased dependency on their phones also performed worse, on average, but the opposite also held a moderating effect. Those who reported decreased dependency had improved scores compared to their peers, even when their phone was kept in plain view. This is all a gross oversimplification (the study is over 10,000 words for a reason), but if it sounds interesting to you, I encourage you to check it out. There's always more to these sorts of things, so if you are interested and think you can handle reading it, you should. As with all studies like this, the sample size and number of experiments will need to be increased and reproduced before anything can be known with certainty, but I honestly wouldn't doubt it if there was some truth behind it. I know I'm distracted by anything that's out when I'm doing work.